Plaque for Dr Martin Luther King Jr outside the Lorraine Motel, Memphis. via Wikimedia Commons. This article is excerpted from An Act of State: The Execution of Martin Luther King by William F. Pepper, a friend of King's and the attorney who represented the King family in the civil lawsuit against Loyd Jowers and other co-conspirators in King's assassination. By mid-1967, Dr Martin Luther King Jr began to formulate a strategy to address the widening gap between the rich and the poor. The project gradually took the form not of a march by itself but the extensive Poor People's Campaign and mobilization culminating in an encampment in the shadow of the Washington Memorial. The projection was for the establishment of a tent city of some 500,000 of the nation's poorest and most alienated citizens, who would regularly lobby their elective officials for a range of socio-economic legislation. They would remain as long as it took to get action from the Congress. If the wealthy, powerful interests across the nation would find Dr King's escalating activity against the war intolerable, his planned mobilization of half a million poor people with the intention of laying siege to Congress could only engender outrage — and fear. They knew that it was not going to be possible for the Congress to satisfy the demands of the multitude of poor, alienated Americans led by Dr King, and they believed that the growing frustration could well lead to violence. In such a situation with the unavailability of sufficient troops to control that mass of people, the capital could be overrun. Nothing less than a revolution might result. This possibility simply could not be allowed to materialize, and neither could Martin King's crusade against the war be permitted to continue. When the NCNP convention was held on Labor Day weekend, many of us believed that nothing less than the nation's rebirth was on the agenda. But a small, aggressive group had urged each arriving black delegate to join an obviously planned Black Caucus which at one point threatened to take Dr King hostage. He made a spirited speech, calling for unity and action, after which I had to arrange for him to leave the stage quickly under guard for his own safety. Black Caucus delegates voted en bloc. There were walkouts, hostilities, and splits. Though we didn't admit it at the time, the NCNP died as a political force that weekend. We had not realized the power of the forces ranged against us to divide the emerging coalition and to infiltrate and manipulate movement organizations. Dr King stepped up his anti-war efforts and threw himself into developing the Poor People's Campaign which was scheduled to bring hundreds of thousands of the nation's poor blacks, Hispanics, whites, and intellectuals to Washington in the spring of 1968. He would, of course, not live to see it. Since their plight was the very epitome of the condition of the wretched of America, Dr King lent his support to the Memphis sanitation workers' strike by predominantly black non-union workers. On March 18 1968 he addressed a meeting at the Mason Temple and called for a general work stoppage in Memphis. He agreed to return to lead a march and did so on March 28. Chaos descended, and the march was disrupted. Because he was determined to lead a peaceful march, it was rescheduled for April 5. He returned to Memphis on April 3, checking into room 306 at the Lorraine Motel. At 6:01 PM the next evening, he was shot dead on the motel balcony. The FBI hunt led to fingerprints on a map of Atlanta found in a room in the city hired by a man calling himself Eric S. Galt. They matched those of a fugitive from a Missouri penitentiary — James Earl Ray. He fled to England, but eventually, on Saturday June 10, he was arrested at Heathrow Airport and extradited to the United States. The case never came to trial because James Earl Ray entered a plea of guilty on Monday March 10 1969. He was subsequently sentenced to 99 years in the state penitentiary. Within three days of arriving there, Ray had written to the court requesting that his guilty plea be set aside and that he be given a trial. Any reservations I had about another lone-assassin explanation for the removal of a progressive leader were sublimated by the combined feelings of grief, sadness and disgust with all politics. During the next nine years, I had virtually nothing to do with the civil rights and anti-war movements. I had no hope the nation could be reconstructed without Martin King's singular leadership. Then, in late 1977, Ralph Abernathy, who had succeeded Dr King as the President of Southern Christian Leadership Conference (SCLC) but had been replaced in 1976 by the Reverend Joseph Lowery, and who had been a close friend of Dr King, told me that he had never been completely satisfied with the official explanation of King's murder. He wanted a face-to-face meeting with the alleged assassin. Although I was surprised by his interest I told him that I had assumed that the right man was in prison and that I knew very little about the case. If I was to help him, I would need time to catch up on the facts. In the absence of a trial, the prosecution's scenario had been put out to the world as the final word, bolstered by books written by publicists of the official story and media coverage. To the general public, Ray was a loner, motivated by race hate, who sought to make his mark in history. The state claimed Ray began stalking Dr King on the weekend of March 17 in Los Angeles, arriving in Memphis on April 3 with the murder weapon and booking into a seedy rooming house above Jim's Grill. 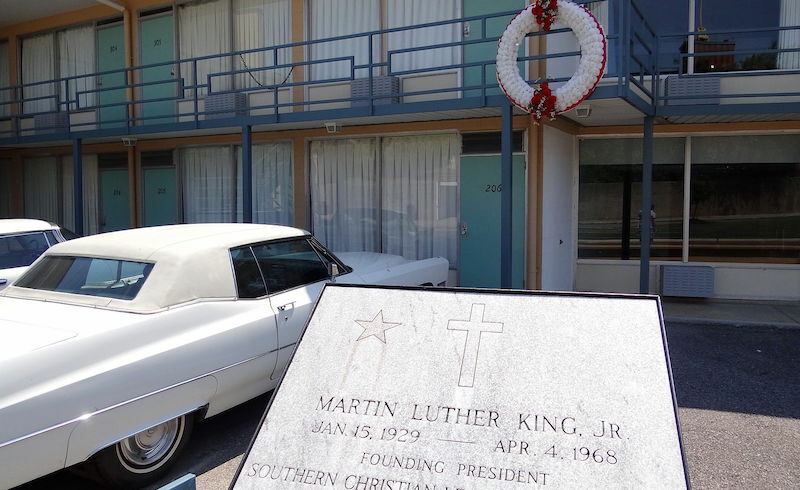 It had a bathroom overlooking the Lorraine Motel balcony, where Dr King was standing when he was killed. Ray, according to the state, locked himself in and fired the fatal shot. Then, in haste, he neglected to eject the spent cartridge. Straight afterwards, he gathered up a few belongings from his room and ran down the front stairs, allegedly seen by rooming house tenant Charles Stephens who became the state's chief prosecution witness. Supposedly seeing a police car parked near the sidewalk of the fire station, Ray allegedly dropped the bundle in the recessed doorway of the Canipe Amusement Company on South Main before jumping into his white Mustang and heading for Atlanta, where he ditched the car. He then made his way to Canada. His prints were found on the gun, scope, binoculars, beer can, and copy of the Memphis Commercial Appeal dropped in the bundle. During this period, the House Select Committee on Assassinations (HSCA) had been set up to investigate the murders of President Kennedy and Dr King. Following Ralph's request, I began to read everything I could about the killing. Meanwhile in early June 1977 after a failed escape attempt, James Earl Ray was returned to his cell at Brushy Mountain Penitentiary. Finally, on October 17 1978, with Ralph Abernathy and a body language specialist in attendance, I met Ray. He told us he had been set up, his actions leading up to the assassination coordinated through a shadowy figure called Raul. He had met this man in the Neptune bar in Montreal in August 1967 while on the run, looking for a way to leave North America. At the end of the interview, Abernathy and I agreed. Ray was not the shooter. As we left the prison, Ralph Abernathy told waiting journalists that Ray's answers to questions convinced him more than ever a conspiracy had led to Martin Luther King's death and Ray should get a trial. I was troubled by the discrepancy between the public image of James Earl Ray and the person we interviewed, as well as by the unanswered questions of which I became aware. The more I thought about the issues, the more concerned I became. I decided to quietly probe the official story. It was the beginning of a quest that was to last more than a quarter of a century and which would ultimately expose the dark underbelly of American government and the covert activities of its military and intelligence organizations and their fealty to corporate interests and organized crime.